individuals who choose to polish shoes instead of begging are indeed an inspiration. At railway stations, a large part of the shoeshine man’s salary is paid to the station, leaving only 60 to 70 Rupees after a long day’s hard work for the shoeshine man to feed his family and send his children to school. Three major aspects must be concentrated on, for the development of shoeshine men: enactment of laws to protect their interest, changing people’s mental attitudes towards them and co-ordination among the shoeshine men themselves. There have been a few examples where shoeshine men left railway stations and started polishing shoes in shops and airports. It is good sign that at places like airports, shoe shining machines are being replaced by people. It’s time we start thinking about the people of this noble profession, without who, many of us would be unemployed (because of our going to interviews with unpolished shoes). 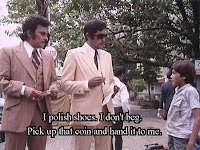 After the 1975 classic movie 'Deewar', it was believed that the profession of shoe polishing had been immortalized by the boy who grows up to be a rough but lovable character, Vijay Verma, played by Amitabh Bachchan. The scene, in which the boy refuses to pick up the money thrown by an important man, not only became a famous scene but also gave rise to different versions of a dialogue that is often paraphrased, "I don't pick up money that is thrown." Before ‘Deewar’ the shoeshine profession gained some fame from the success of the movie ‘Boot polish’. For a brief period the shoeshine men held their heads high, they felt a pride and a feeling of security. Their once looked down upon profession had gained national recognition and appreciation. However, they are now constantly in danger becoming extinct. Modern technology may not be threatening the profession of street vendors or auto-rickshaw drivers, but shoe-shine men are constantly under the fear of being replaced one day by automatic shoe shine machines, that work on sensor technologies. These machines operate on infrared technology and many are lightweight and can be placed anywhere. Till today, they have usually been found in malls, hotel lobbies, washrooms, airports, etc. but they may be seen on railway platforms in the coming years. These machines consume very little electricity and shoes are polished in 30 seconds flat. But do they give that 'attention to detail' that shoe-shine men give? Certainly not! Furthermore, the present shoeshine men are under the threat that the Railways will issue tenders for shoeshine men at station on the basis of open bids, in which they would definitely lose. 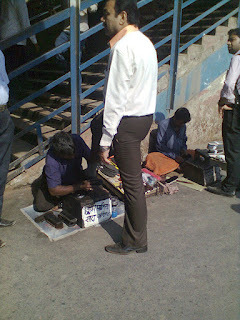 On average a shoe-shine man makes between Rs 85 to 150 per day. Of this approximately Rs 30 per day goes towards buying work material, and Rs 10 to 12 per day is paid to the society. This leaves the shoeshine man an average of a meager Rs. 70 after working hard in the sun, on the ground, for over 12 hours. 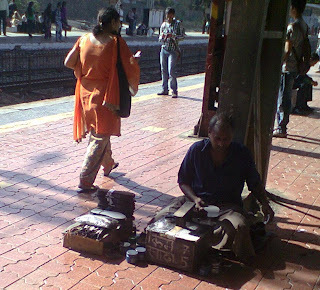 In 2007, Mumbai's Central Railways issued tender inviting open bids from interested private parties to run the shoeshine stalls in six zones along the Central and Harbour lines. The shoeshine men protested immediately. They were ready to pay an increased sum, but if there was an open bid, they would definitely be out-bided. In fact, the highest bid offered was Rs 4,17,600 by a Mr. R. B. Singh, for a zone consisting of stations from Thane to Kalyan,. But it was rather obvious that these new bidders would not polish the shoes themselves, but rather outsource the work. In such a case the shoeshine men would have to pay the society huge sums such as Rs. 40 per day. They would have nothing left to feed their family or send their children to school. The matter died down but there is always the fear that it will rise again. Shoeshine boys are often tapped by security agencies for information on suspicious activity in their surroundings. WR officials said the reason behind the move was that vendors, coolies and shoeshine boys are present on platforms at all hours and would be the first to notice anything amiss. Abhishek Kumar Bharatiya the son of a shoeshine man named Rajendra Prasad, had managed make it to the IIT with a rank of 154 in the SC/ ST category in the entrance examination in 2010. His life has been an endless struggle due to his economic background. Rajendra lived with his wife, Abhishek and three other sons in a 10 ft by 10 ft single room in Kanpur. They had no electricity and they have to make do with a kerosene lamp. Abhishek, who wishes to become an aerospace engineer from IIT- Kanpur, are to get a job, convince his father to give up his work as a cobbler and help his brothers get admission in reputed schools. Abhishek would work with his father as a shoeshine boy and at times would find a job as a labourer to earn some extra money, Rajendra said to the media, “. He is a popular shoeshine boy but doesn’t like to do it for obvious reasons. He often used to work as a labourer to earn some extra money for his books and stationery.” However, getting into IIT comes with a price and his father Rajendra Prasad is not sure whether he would be able to pay for his son’s fees with his meagre income. “I am ready to sell off myself to see my son become an engineer. Let us see if my dream comes true,” Rajendra said. Abhishek’s mother, Sangeeta Devi repairs old clothes of poor people and used to earn about Rs 50 a day. “My husband gets around Rs 100 and I earn Rs 50 in a day. It is not enough for us. But we don’t want to beg. We want to live with our heads held high.” She said to the journalists of the Indian Express. 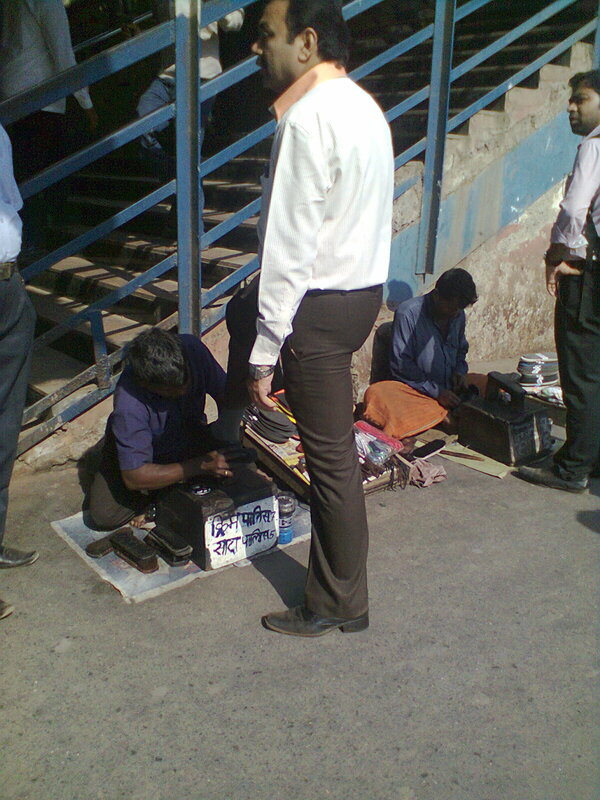 Recently, In December 2011, some shoeshine men on Central Railways started charging Rupees seven instead of five. Apparently, the price increase was permitted only in Western Railways and not Central. Due to this confusion, all the shoeshine men on the Central lines were removed. Currently, Mumbai's shoeshine industry is run by ten cooperative societies, which are composed entirely of shoeshine men, including the societies' office-bearers. The societies, on behalf of their members, pays a stipulated maximum of Rs 5 per day to the railways, while using the remainder for its expenses, fixing the yearly amount paid to the railways at Rs 1800. It is worth noting that most shoeshine men are migrants from Uttar Pradesh, who came to Mumbai because of desperate need of income. 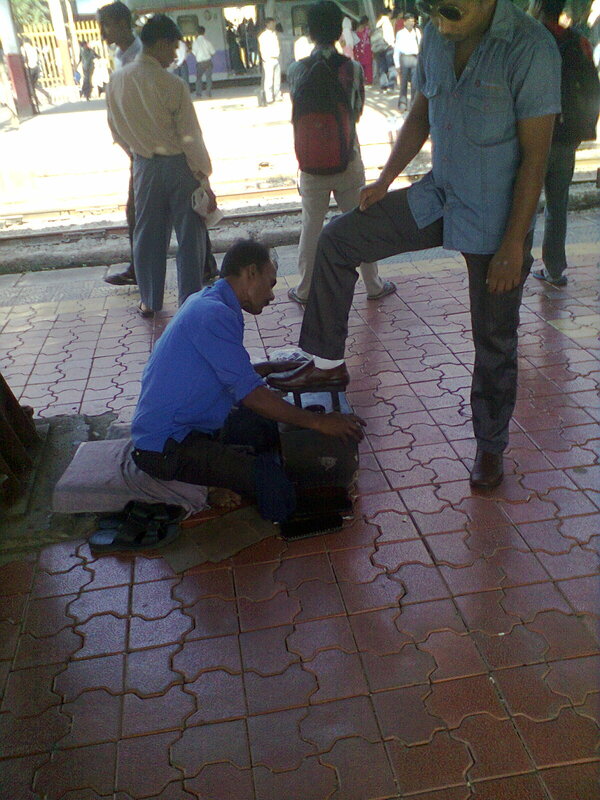 Shoeshine and other similar professions which are carried out at railway stations also come under the scope of Section 144 of The Railways Act, 1989, which states “Prohibition on hawking, etc., and begging.-(1) If any person canvasses for any custom or hawks or exposes for sale any article whatsoever in any railway carriage or upon any part of a railway, except under and in accordance with the terms and conditions of a licence granted by the railway administration in this behalf, he shall be punishable with imprisonment for a term which may extend to one year, or with fine which may extend to two thousand rupees, or with both”. 1) RM:- He was approached in 2007 by ‘Times of India’ for an interview. I noticed him at Andheri station several times after that but had never spoken to him before. He left his studies in Class IV to shine shoes because his elder brother died accidentally on the rail tracks. He is the secretary of The Bombay Harijan Cooperative Society, in charge of shoeshiners from Khar Road to Goregaon station on the Western Line. · Me: Sir, How long have you been working as a shoeshine man? · Me: How do you find your work? Ravikishan Mehra: Work is work. The shoeshine men sitting around me are my friends. We talk and pass the time while working. · Me: A few years back the Government issued a tender for shoeshiners…. RM: What can I say now? The Government does not understand us. People like me who have sat here for over 20 years, cannot be deprived of their jobs. That too why? Because the Government wants make money! Are we not human beings? At my age I cannot change my profession. · Me: You are the secretary of a cooperative society. What does your work include? RM: The work is not much, but it is important. 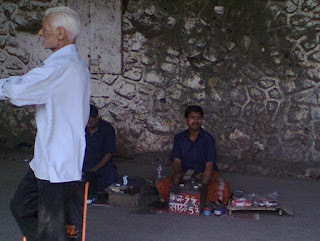 The other shoeshine men between Khar and Goregaon pay me the money that goes in the society’s fund. Every month I pay the railway 150 rupees, the rest of the money is saved and spent only on society’s other expenditures. 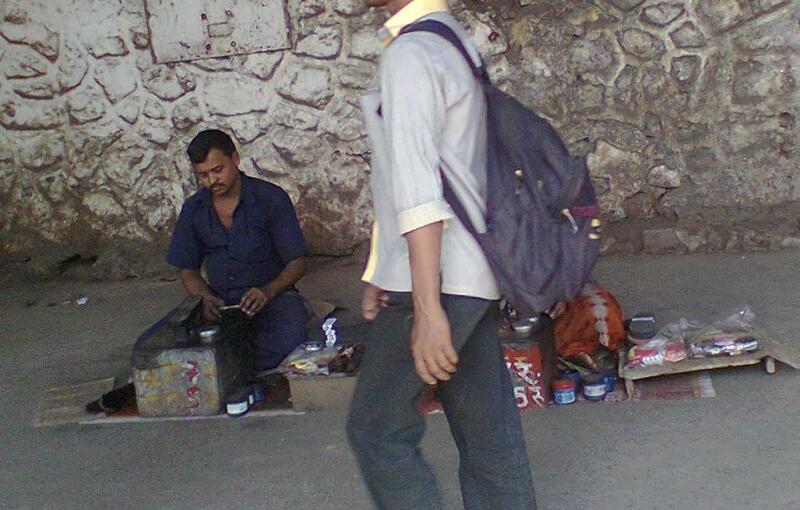 2) RP:- A shoeshine man who sits at Dadar station. When I told him about my project and that Ravikishan Mehra sent me, he was more than happy to talk to me for fifteen minutes, while polishing shoes at the same time. RP: (Looking up and thinking) Must be about 18 years now. RP: Wife and two daughters. (Answering my next question before I can ask it) Both of them go to school. · Me: How do you manage that? RP: It’s not easy. But it is not just my profession anymore. It is my life. If I have to leave work for few days to go to my village, then I don't feel at ease. My hands start shivering. Now days, education is also very important, I want my daughters to make a place in the world. · Me: That’s very nice. What is the biggest problem you face in your profession? RP: My brothers (other shoeshine men) are disturbed by the low pay and lack of security. Today we are sitting here; tomorrow we may land on the streets begging. But what disturbs me, the most, is the fact that people think low of us. My family is not valued by my neighbors because of my profession. Even people who get shoes polished do not even say a simple 'Thank you'. 3) GM:- He was the youngest of the three. He sits at Churchgate station. GM: Just got married few months ago. · Me: Congratulations! What about future plans? GM: I'm trying to get a job as a watchman. · Me: But why? You are not happy with your current job? GM: It’s not that I hate the job. I don't even love it. But for money you have to do something. What I make here is not enough to feed my children, when I get children. 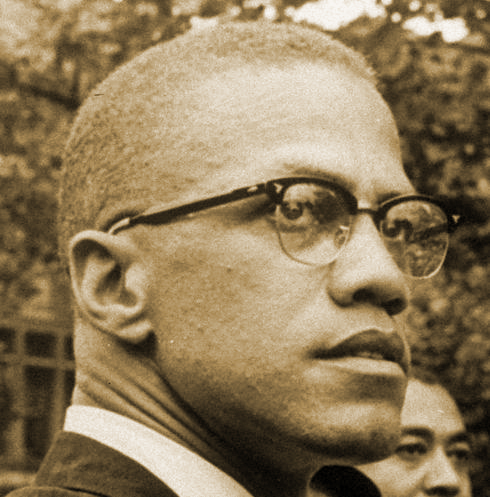 GM: Only we shoeshine men now about the conditions in which we live. We don’t even have a fixed salary. Three days back I went home with only 60 rupees, whereas otherwise I go home with not less than 85 or 90 rupees. It is a matter of luck. No young man, even if he is uneducated, will want to do this job. There is only one shoeshine man at Churchgate station who is younger than me. And he is only doing this job because he is one-legged. · Me: But why do this job for 12 years if it is so bad? You could have changed earlier. GM: I came in Mumbai to look for a well paying job. In U.P. there was no scope for work for someone like me. In Mumbai I felt lucky to even get this one. That too my uncle who used to work here got me this job. My financial condition was such that I could not take the risk of changing jobs. If I quit this job and lose the other I would be in a very difficult situation. · Me: Do other shoeshine men also change their profession? GM: Yes, one man left to work at a bank. Another is working at a restaurant. I don’t know what they exactly do, but the pay was at least double of what they got here. The shoeshine men's protest has not gotten much momentum because of lack of support from commuters. The commuters only want their shoes polished. They don't care who is doing it. Even if the shoeshine men went on strike, it would only be effective if the strike was for more than one week and they cannot afford to do that due to their financial conditions. Fortunately, the shoeshine profession seems to be more organized than most other professions. However, these connections are mostly within their respective societies and relations between shoeshine men of different societies are not that well structured. Other than their Constitutional right of livelihood, which the Supreme Court has held to be a vital part of the ‘Right to life and liberty’ in Article 21 of the Constitution of India, 1949, there are very few laws that protect the professional interest of shoeshine men. Section 144 of The Railways Act, 1989 provides the law by which no shoeshine man can carry out business at railway stations without an express license. 144. Prohibition on hawking, etc., and begging.-(1) If any person canvasses for any custom or hawks or exposes for sale any article whatsoever in any railway carriage or upon any part of a railway, except under and in accordance with the terms and conditions of a licence granted by the railway administration in this behalf, he shall be punishable with imprisonment for a term which may extend to one year, or with fine which may extend to two thousand rupees, or with both: Provided that, in the absence of special and adequate reasons to the contrary to be mentioned in the judgment of the court, such punishment shall not be less than a fine of one thousand rupees. The current law that is based on the new national policy of privatization and open bids for licenses in railway is unjust. The existing process is one that has been going on for years. If at all privatization has to be introduced, it should be a slow and step by step process which will not affect the already working shoeshine men at stations. All shoeshine men want is 1 sq.ft. area. 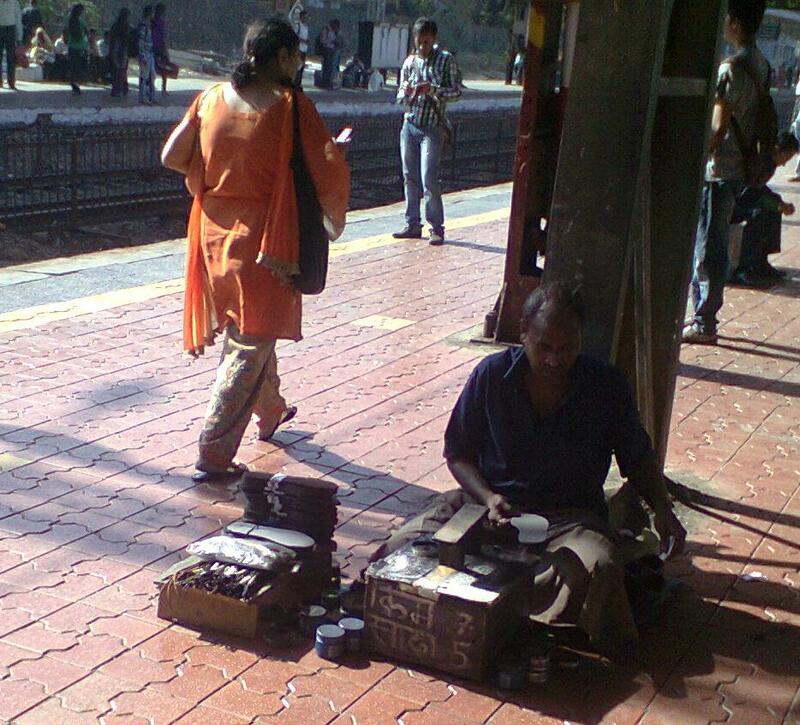 While walking at station, has it ever happened that a shoeshine man has been obstructing the path? Those who do not get their shoes polished at station hardly even notice them and if at all they do, it’s probably just by their signature sound 'thuck, thuck, thuck…' that they use to attract customers. 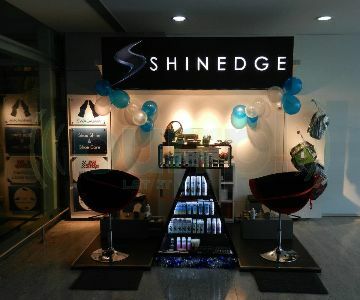 In 2011, 'Shinedge' stores, which delivered shoe care services, opened at four places- Two at the Hyderabad airport and one at the Hyderabad golf club and one at Mumbai's domestic airport Departure terminal 1B. T The three men, who were hired at the store in Mumbai, were formerly working as shoeshine men at CST and Kurla. The store not only pays them well, but has also trained them in communicating with the high-profile passengers and taught them English and etiquettes. This store has gained several praises in the past few months over its thorough, quick and efficient service. Shinedge also seeks to spread its wings at Powai and Worli. It should be realized by Government authorities as well as by common people, that people trying to make an honest living cannot be treated as animals. Indeed, it cannot be expected of shoeshine men like Ramkishan to shift from a profession they are doing for over two decades, especially at their age. Even if it is necessary to issue such tenders on basis of open bid, the shoeshine men must be assured an alternative and better paying profession, which does not require any new or difficult-to-learn skills. Furthermore, it should be kept in mind that since the profession of shoe shining is one in which a person cannot earn a large living. The costs of at which tenders are being sold is too high. Even the cost of the documents required to apply for the tender is about 500 Rupees. The shoeshine men should on their own part maintain co-ordination among themselves and hold at least half-annual meetings in which shoeshine men all over stations of Mumbai (and maybe even beyond) should be included. Subject matter to be discussed can range from the suggestions of use of surplus budget of the societies to opposing new policies that threaten their profession. The frequency of meetings should increase when new threats to their profession arise. Original Image. Taken at Andheri Station, Western Railway Line, Mumbai. Original Image. Taken at Bandra Station, Western Railway Line, Mumbai. Original Image. Taken at CST Station, Central Railway Line, Mumbai. Thank you. I hope this article on shoeshine workers has been informative and maybe even inspiring to you. is anyone aware of any agency for shoe shiners in Mumbai where i can hire them ?